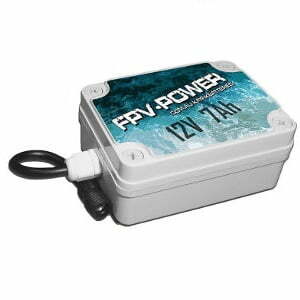 Our range of lightweight compact 12V Lithium Ion kayak batteries are specially designed to power all electronics onboard a fishing kayak. The main advantages of Li-Ion over Pb (lead acid) batteries is their compact size, light weight (roughly weighing 1/6th of a lead acid in the same capacity) and their ability to be drained down to close to 0% without affecting overall battery life and longevity. Standard lead acids will start to deteriorate when discharged below 50%. 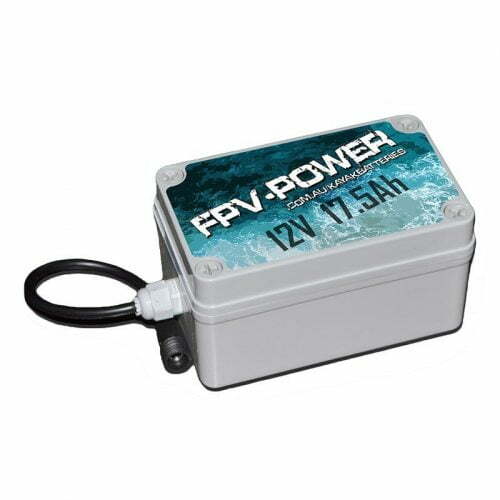 This means that a 10Ah Lithium is roughly equivalent to a 20Ah Lead Acid! Li-Ions also don’t create any memory and can be topped up regardless of their current charge level. Lithium batteries also hold their voltage much higher throughout their discharge cycle than lead acids and have a much higher cycle life. Our battery packs are designed with safety as our number one priority and come waterproofed with an IP67 rated hard case and battery plug. We have also included a Battery Management System (BMS) which will auto cut off the power if there is an external short and will also protect the battery from over discharge when in use and overcharge when charging. We use the densest, top quality, Japanese Li-Ion cells currently available to provide you with the smallest, most lightweight battery packs.